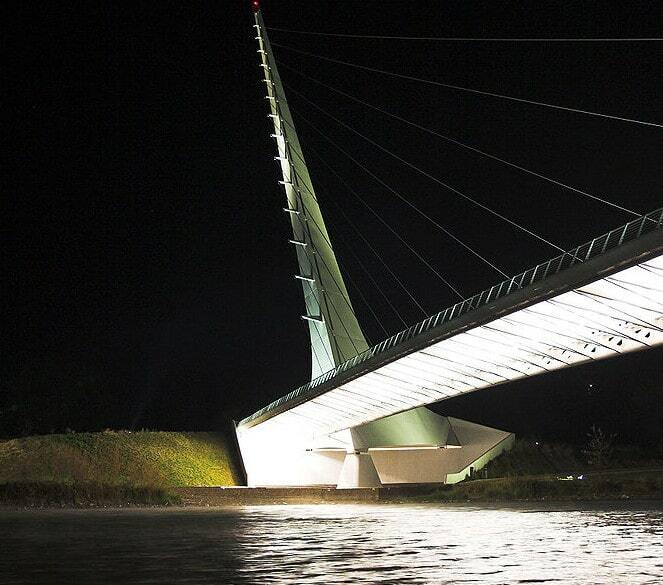 Spawned by the need to protect a seemingly insignificant patch of gravel, not many folks know that Redding’s iconic Sundial Bridge rose as a result of an eco-challenge surmountable only by architect Santiago Calatrava’s sensitive and innovative expertise. Abandoned since the long-gone days of mining in Redding, California, submerged quarry beds along the north shore of the Sacramento River have historically served as spawning grounds for Chinook salmon. 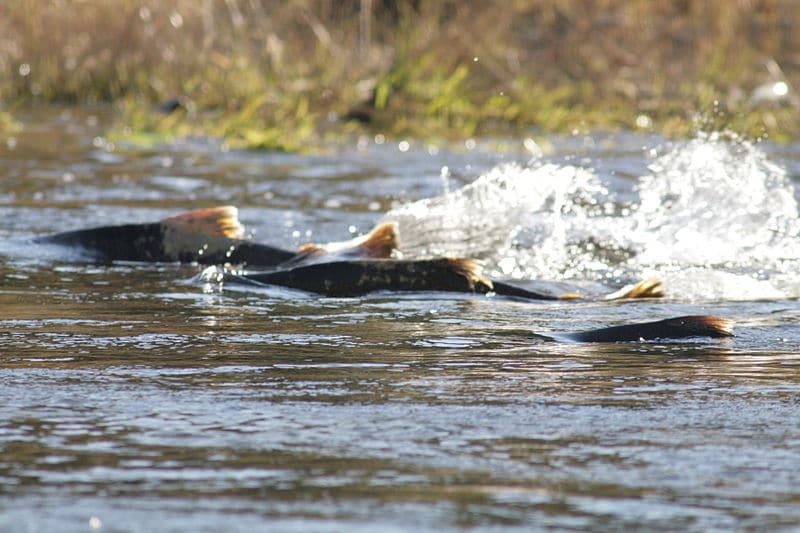 Four endangered runs form a 300-mile upriver stretch ultimately guiding an annual salmon marathon to this exact location for laying their eggs and breeding. Developed in the 1990’s on the site of this humble gravel quarry, the 200-acre McConnell Arboretum and Gardens helped drive a typical California cowboy town into the high-styling world of modern art and architecture. As the beautifully developed Turtle Bay Exploration Park rose across the river from the arboretum and gardens, a plan arose to link the two popular attractions by a pedestrian bridge spanning the Sacramento River. 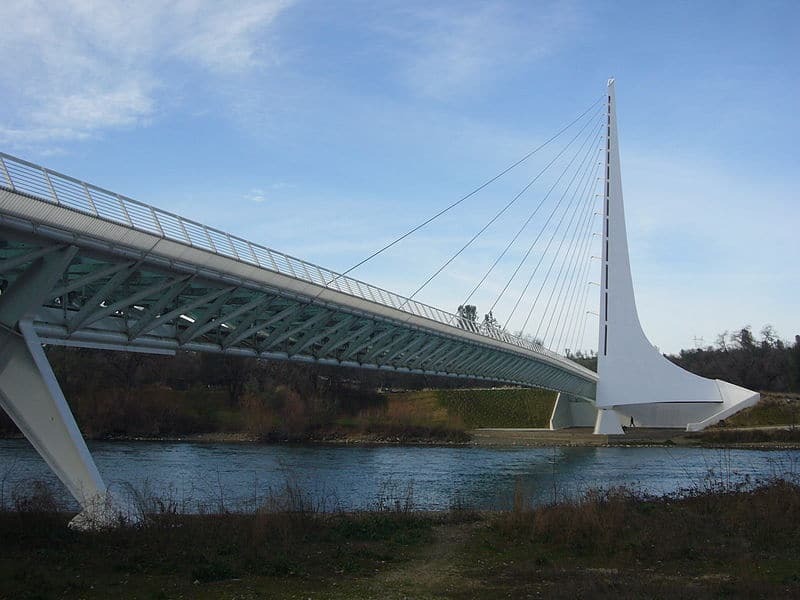 Following years of political wrangling and indecision, the City of Redding finally raised $3 million to pay for the proposed pedestrian bridge. Focusing on the natural history of the Sacramento River, Turtle Bay Exploration Park immediately raised alarms concerning probable damage to the historical and highly vulnerable salmon breeding grounds. Fortunately, these concerns were heeded and a formal set of eco-friendly engineering criteria for the proposed bridge was duly adopted by the city. The most challenging environmental requirement stated that the bridge could have no part of its structure in the river. Nothing even temporarily could disturb the river at any point in its construction. This proved to be a major engineering challenge for local bridge builders. And, when the city-appointed committee was unable to secure a satisfactory bridge designer capable of meeting the challenge, the plan eventually stalled. McConnell Foundation Vice President John Mancasola, a member of the bridge committee, suggested enlisting world-renowned architect Santiago Calatrava. It was an expensive suggestion, ultimately costing the private McConnell Foundation over $20 million. Nevertheless, with great visionary confidence, Mancasola phoned the famous Spanish architect at his headquarters in Zürich, Switzerland. It was Calatrava’s favorite of the three designs that the city selected. A tall, curving pylon stretching 217 feet high supports a fan of cables carrying the pedestrian bridge lightly across the river. Nary a ripple disturbs the salmon swimming below the surface. Calatrava’s entire design is exquisitely eco-friendly. Not wishing to impact the sensitive water temperature needs for the salmon breeding ground, Calatrava chose translucent glass paving tiles for the bridge surface. The sun’s rays pass through, without casting dark shadows on the water that might otherwise lower the temperature. “It was necessary not to disturb the ecological equilibrium,” explained Calatrava. The north-south orientation of the bridge offered the spark of inspiration transforming the 217-foot pylon into an iconic, monumental sundial. Because the pylon is anchored into the ground, instead of in the water, Calatrava creatively engineered the platform into the base of a sundial. Visitors may witness the earth’s revolution around the sun as the pylon’s shadow revolves at a speed of about one foot per hour around the white ceramic markers in the plaza. Further enhancing his ingenious solar theme, Calatrava designed the pylon to be hollow. Slots in the pylon align with the sun at high noon, spectacularly illuminating the structure’s interior for visitors viewing up into the pylon from the base. With an endowment of $344 million, the McConnell Foundation’s mission is to “build better communities through philanthropy,” and right decisions easily justify their expense. Even when they become really unpopular and expensive. With limited cultural attractions in the region at that time, few Redding residents had acquired an appreciation for bridges of Mr. Calatrava’s caliber. That’s all changed now, however. From its Fourth of July grand opening in 2004, the Sundial Bridge has grandly risen to meet the generous expectations of John Mancasola and the McConnell Foundation. 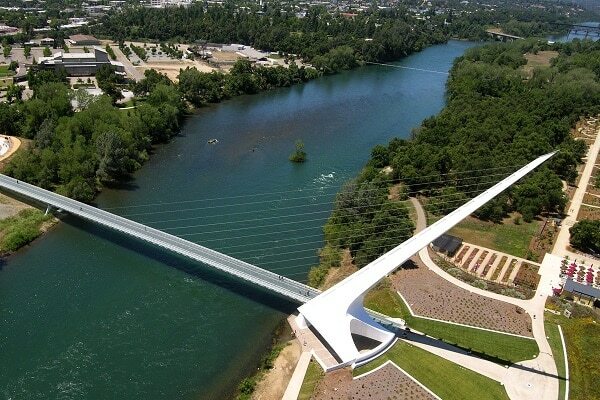 Annually reaping millions of dollars in revenue for the McConnell Arboretum and Garden, Turtle Bay Exploration Park, and the region in general, Redding’s Sundial Bridge draws an annual marathon of visitors from all over the world. 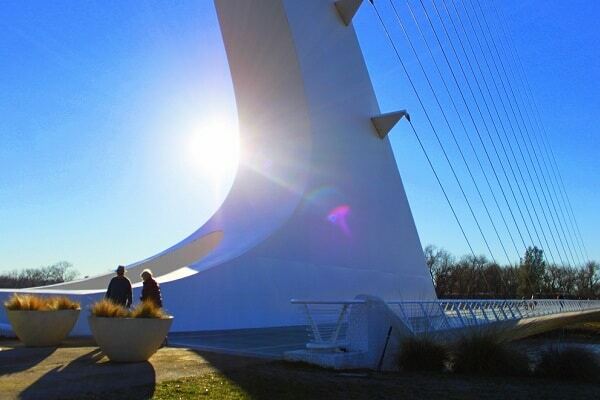 As the gateway to Redding’s 50-mile Sacramento River trail system, the world-class Calatrava Sundial Bridge is a remarkable monument to visionary environmental conservation. And, as Calatrava suggests, if you sit down under it and observe the peaceful water, you’ll see his iconic Sundial Bridge is a truly exquisite gesture of human kindness to the salmon spawning peacefully below.